IT IS A COPPER GLASS SET FOR KITCHEN. 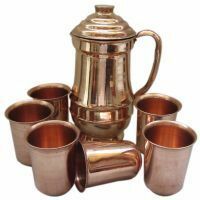 COPPER IS CONSIDERD AN ESSENTIAL MINERAL FOR OUR BODY.AYURVEDA RECOMMENDS STORING WATER OVERNIGHT IN A COPPER JUG AND DRINK THE SAME IN THE MORNING KEEPS GOOD HEALTH.THE WATER STORED THIS WAY IS CALLED ''''TAMRA JAL'''' AYURVEDA RECKONS COPPER JUG WATER TO BALANCE ALL THE THREE DOSHAS. SIZE (JUG) : DIA 4"X H 7.5"
(GLASS): DIA 3" X H 3.5"
1. The Image is of Original item but does not represent the actual size & colour of the item as it is cropped for display. What you see herein the Picture, is what you will Get. 2. The Weight May Slightly Vary Due to Difference in Calibration of Weighing Scales. 3. You Might Find Slight Difference in Colour Due to Difference in Lighting Conditions & Difference in Resolution of Colour Monitors.